We've all been there—you're stuck on the street or in a bar when you're iPhone hits 1%. Without a charger on hand, you spend the next few minutes panicking as your phone shuts off completely; you're now totally cut off from calls, emails, and Instagram, which pretty much means all of society. 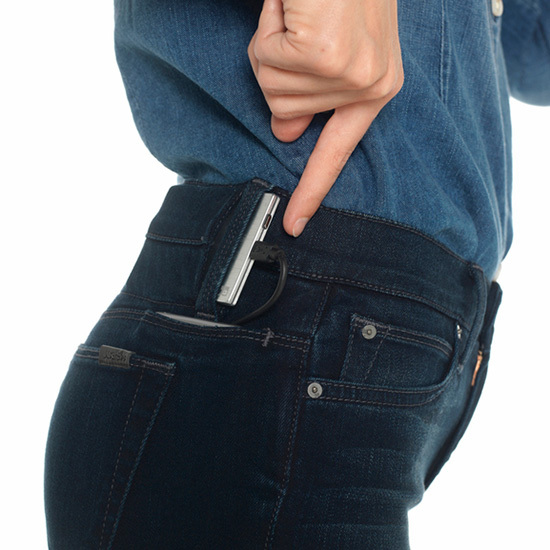 Well, Joe's Jeans Founder and Creative Director Joe Dahan is out to make sure that never happens again with the #Hello jean, an innovative new denim style that comes with patent pending pockets and a battery pack connected to a detachable USB cord that wait for it…charges your phone. "At first, the idea began with a casual conversation about how technology and mobile devices have changed the needs of our customers," says Dahan. "Today, everyone is constantly on the go and we wanted to make their lives a little bit easier. We were in touch with a company that has experience in designing portable batteries and was currently developing a new sleek design that hadn't yet been seen. Most batteries are oddly shaped, heavy, and rather bulky, but we realized that this new slim, lightweight product opened the possibility for women to both carry and charge their phones in a discrete, yet stylish way." The mid rise skinny jean launches today on joesjeans.com in four washes: black, grey, indigo, and a washed indigo with ripped knees and retails for $189. The battery pack is not included, but available for an additional for $49. Worth the investment if you ask us.